When I was in college, my friends and I would regularly run an “outer” around the outer perimeter (about 4.5 miles) of the U.S. Naval Academy to stay fit. One of my friends complained that even though he ran as much as I did, he wasn’t as fast as I was when we had to run 1.5-miles as part of the semi-annual PRT (physical readiness test) or raced in a local 10K. During his training runs, my friend ran the same steady pace … all the time. I didn’t understand exercise science at the time, but I intuitively knew that in order to run faster, you have to (not surprisingly) run faster. I would eventually learn that the easiest way to do this is by interval training. This holds true for running all triathlon distances from sprint to IRONMAN. So, how does interval training work and what does it look like for the triathlete? Our skeletal muscles, which provide movement for our bodies, are each composed of a mix of muscle fiber types commonly identified as Type I (slow-twitch), Type IIa (fast-twitch) or Type IIx (fast-twitch). Slow-twitch fibers are smaller, more efficient and fatigue resistant (more endurance) as they are better able to utilize aerobic (oxygen) energy pathways, but produce less power and speed. On the other hand, fast-twitch fibers are larger and produce more power and more speed but fatigue more easily. Based on the intensity of the activity being performed, muscle fibers within a muscle are generally recruited in the following order: Type I → Type IIa → Type IIx. What this means is that in order to recruit and train fast-twitch muscle fibers, you must train at higher intensities; otherwise, the slow-twitch fibers within are adequate to meet activity demands without recruiting fast-twitch fibers. When trained, the Type IIa fibers become more fatigue resistant (albeit still less than Type I). Because they provide greater contractile force than Type I fibers, trained Type IIa fibers allow top-end endurance performance across all triathlon distances. Bottom line: If you’re always running at an easy-to-moderate pace (commonly referred to as Zone 2), then you’re missing out on training the fast twitch fibers and will race below your performance potential. One of the best things about intervals is that you don’t have to do a lot of volume to get a lot of benefit. Like any type of training, “use it or lose it” holds true for training fast-twitch muscle fibers. Here are three run interval progressions that you can perform as part of a run workout each week over a four-week period to run faster in your next triathlon. The interval sets are progressed from one week to the next by altering the number of repetitions, duration of each repetition, and/or the rest interval between repetitions. Strides are short, quick, fast accelerations (but not sprints) that are designed to activate fast-twitch muscle fibers. Strides can be easily incorporated into a run workout warm up and are appropriate year round. VO2max (or maximal aerobic capacity) can be defined as the maximal rate at which an individual can utilize O2 during intense exercise. VO2max intervals are very hard efforts that are typically between three and seven minutes in duration, and represent the maximum amount of time that an individual can exercise at their VO2max intensity. Performing this type of interval will increase aerobic capacity (body’s ability to use more oxygen) while both decreasing and enhancing tolerance to acidosis (burning feeling in the muscles). 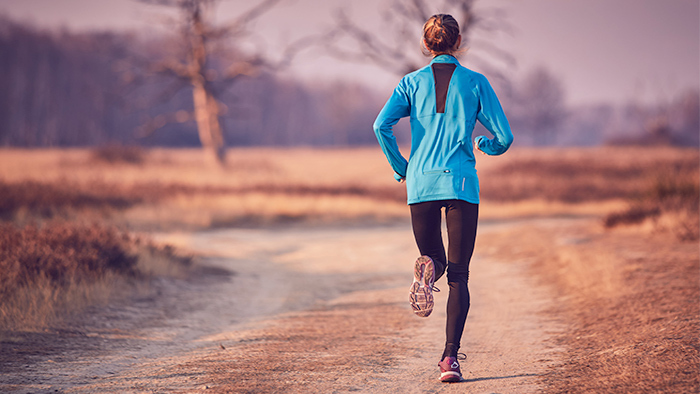 Perform a run workout with one VO2max interval set per week (preferably on same day of every week) on a track or relatively flat trail or road. These intervals are appropriate for pre-competition and competition training periods (starting roughly six to eight weeks out from a goal race). AE intervals are maximal efforts for 30 to 90 seconds that feel VERY, VERY HARD. These intervals are important for the start and finish of the swim, hard steep climbs on the bike and run and quickly surging past other athletes. As my wife and fellow coach likes to say, “Hill repeats are intervals in disguise.” Hill repeats provide an excellent way to get to AE intensity very quickly. Perform a run workout with one AE hill interval set per week. When performing the hill repeats, find a moderate hill (~4-6 percent grade) or set your treadmill at 5-percent grade. These short duration, high intensity intervals are appropriate for all training periods, although not recommended for the off-season. Triathlons are endurance events so endurance training is a primary focus of any training program. However, if you want to maximize your performance potential, then you must include intervals. Do these intervals progressions over four weeks and be faster in your next triathlon run. If you are interested in some more run interval workouts to improve your triathlon run, download one of my free, four-week run interval training plans here.